even before the game starts up, we`re treated to an explanation screen on how to hold the Wii remote and it`s held in the sideways style like many old controllers of generations past. and just like the previous game in my review, bit.trip beat. once onto the main menu we`re presented with a simple variety of options. worlds 2 and 3 are locked but world 1 is available along with credits and scores. so far so good, seems free of fluff and filler. further examination of world 1 shows it contains eleven levels and a boss encounter. overall it`s a hefty game when you take into account the length of the levels, the difficulty enforcing replays and the supposed drive to collect all the gold pieces, in the regular and special zones. upon making your selection we`re treated to a brief video snippet of commander video crashing unto a planet in the form of a pixellated asteroid, and then rising from the ground with a high res rainbow style light emanating from the crater, thankfully it`s very simplistic and doesn’t deter from the aesthetic. the intro is serviceable as always, and as usual, hides further subtext amongst the intricacies of the commander video story. there`s a speedy 3,2,1 countdown for the level and the game begins. a brief summary of the gameplay: commander video runs from left to right at a nonstop pace, it`s out of the players control. 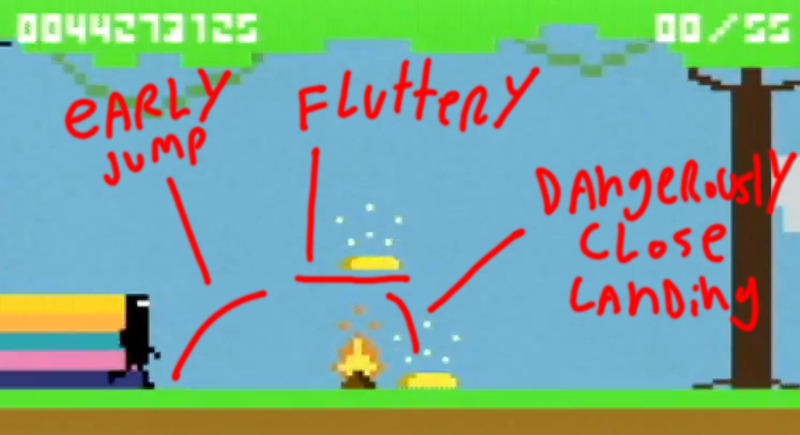 what the player does dictate is all of his actions needed to progress, such as jumping, kicking, sliding and using jump pads and shields. touching any obstacle which would cause the player to stop or slow down, will instantly teleport them back to the beginning and start the level and song again. the first most noticeable difference is the backgrounds. once again they consist of 3D objects stylised like pixels and the colour palette is much improved from the first level of bit.trip beat it no longer clashes with the on-screen action and distracts. it`s a hugely improved abstract landscape and only once you`ve played through the entire world can you deduce that it`s some sort of ore mine or desert. all of the landmarks and animations helped me come to this conclusion. unlike the flashing lights of the original bit.trip beat which would sometimes distract from gameplay, the backgrounds here are a lot more subdued. they very smartly made slow-moving structures in the backgrounds with mild colours that don’t clash. there’s some tall blocky towers rising and sinking, and a chunky planet with pixel shaped openings all over it`s surface. on background layers closer to the foreground, there’s the occasional mining tool, radars and ores. this world is meant to be the outskirts of civilisation and the population are mining it for resources, commander video is making his journey closer towards the populace. it`s great that the backgrounds help tell the story, a technique honed to perfection in super metroid; show, don’t tell. and this only the first level, I`ll talk at length about the games mechanics. there is no motion controls in this title, there is the use of a 4 way directional pad and 2 buttons. interestingly, pressing any button on the controller (wherever it is mapped to an action or not) will produce a different pitch of `beep` it`s a fun little inclusion that lets you ad lib the soundtrack. it has the same method of showing score progression, wherein once you collect enough rainbow shards, the visuals become more intense. the HUD starts to glow like a kaleidoscope and it has a second, low alpha version bouncing on and off the screen to the rhythm, commander video leaves a rainbow trail behind him, certain objects start thumping and bouncing to the beat of the bass and particle effects are strewn everywhere. there`s about 3 more levels to this state of euphoria you can obtain and the effects become more intense with every single one. it`s worth noting that even as these higher spec effects come into play, it never detracts from the games retro aesthetic. they don’t feel out-of-place and they`ve been positioned and balanced perfectly to allow that state of 16-bit immersion. to begin with commander video only has one action, and that is jump. and for 3 stages that`s the only action you`l be using. but even after this, the game forcibly teaches you how jump over a wide variety of obstacles. there’s the ability to do small hops by tapping the jump button, and by holding it down commander video can gain a little extra altitude, and when done from high heights he flutters his feet for even more distance. speaking of commander video, his animation style is something special even in this game. many objects and effects all move at a super smooth pace. like a tween animation. but his run cycle most consist of about 6 frames of animation, giving him a blocky, choppy effect. it`s all timed perfectly to the music however and he looks as if he`s running in sync with the music. it`s mildy jarring to see a strictly 2D character run in such a fashion, in an environment comprised mostly of 3D objects. however, this is a good thing. being how this is such a strict game in terms of timing, having the character stand out really helps you gauge distances to obstacles and lends a certain “difference” to the character which helps associate it as different from the world and more as your controllable avatar. aside from just being well designed for play, the levels correspond perfectly with the music. for every object the player passes, jumps over or destroys there’s an accompanying note. and even when the ground elevates or there’s bottomless pits to hop over, a corresponding sound effect comes into play. all of these come together to form a wholly unique song for every level. there`s over 30 levels in the game and some levels can last up to a brutal five minutes. I don’t think this sort of audio package could have been delivered if it weren’t for the use of low rate retro sounds effects for the soundtrack (keeping mind this game was intended to be a low file size so it could be delivered as a downloadable title) of course, the songs are modernised thanks to the usual bit.trip audio stylings. electronica, bass and echoes all help compliment the games states of euphoria and serve as an additional reminder of the players progress. the fire obviously causes failure and the player will be booted out from the special zone, the only way to reenter is to clear the previous stage with 100% of the gold. these levels can be incredibly tense despite having such a small moveset. the quantity of gold is significantly upped as these levels don’t have a musical theme so design is`nt on audio structure but sheer test of skill. most people assume it would be enough to simply jump over the flames to grab both bars but this isn’t the case. both golds are placed in such a way, so that the first bar is misleading. no matter how you jump over the first flame you can quite easily grab it. the most natural instinct is to jump as late as possible because jumping too soon would obviously cause tha player to land on the flame and fail. 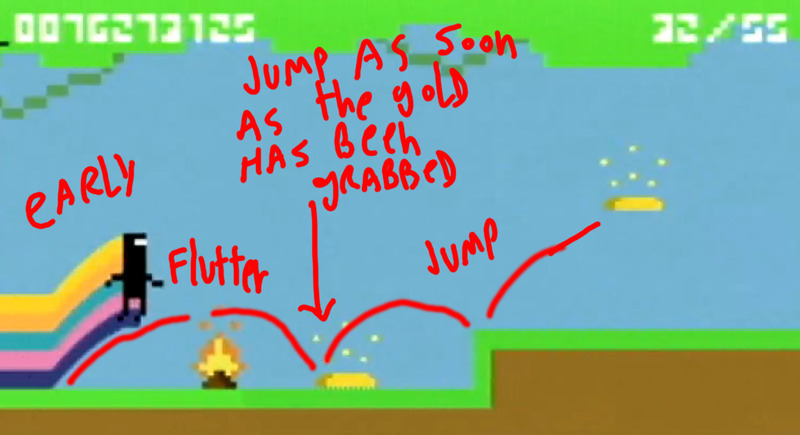 but by jumping mildly early and holding down the jump button, the player flutters just long enough to dodge the flame and land just next to it, able to grab the second gold bar illustrated. this is another example where the played needs to jump early with immaculate timing. 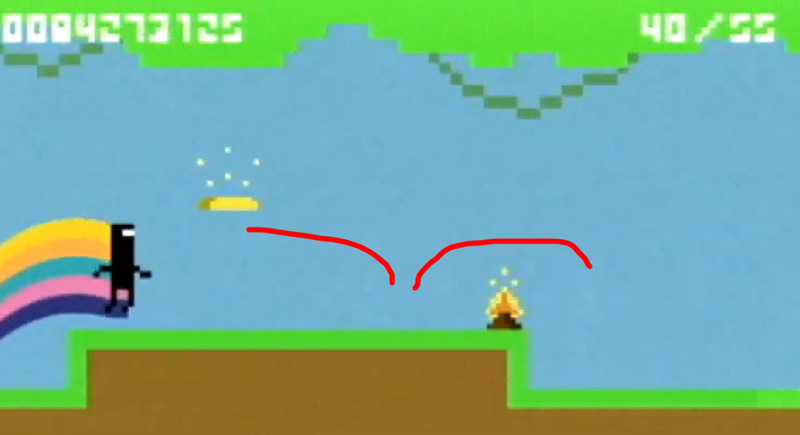 the play could jump over the flame normally and grab the first gold bar. but then they don’t have enough leeway to make the early enough jump to reach the second one. what they need to do, is land as close to the flame as possible, and as soon as commander video touches the left side of the gold bar, flutter jump to the edge of the ledge. as soon it`s been landed on, they need to jump again to reach the second. too soon and they hit the ledge. too late and the third jump will have passed the bar. and then once that final bar has been grabbed, the players first instinct will to be to jump as soon as possible as they`ve been doing it as such a hectic pace for a portion of the level. but doing so will leave them with not enough time to jump again over the fire, or land on it and fail. so im summary, the jump mechanic is more than fully exploited. you could say it`s overused but it is a platformer, that`s never been a credible complaint “you jump too much” it`s even less so, when done with the musical gusto this game has. every jump feels like a note played in a song. the jump pads in the game are exploited to the same degree, depending on which side of it you press `up` on, will affect your trajectory through the air. it`s essential you press up on the right side if you want to nail certain streaks of gold bars as you can’t control yourself in mid-air. it`s a very rewarding feeling when you do, to have such skill in timing pay off. as I noted in my previous bit.trip beat examination, this is a recurring theme with retro games. instead of using filler, like extraneous moves and additional content of a lesser quality. this game focuses on it`s few key mechanics and does them very well. bit.trip runner absolutely nails the `feel` of the jumping. 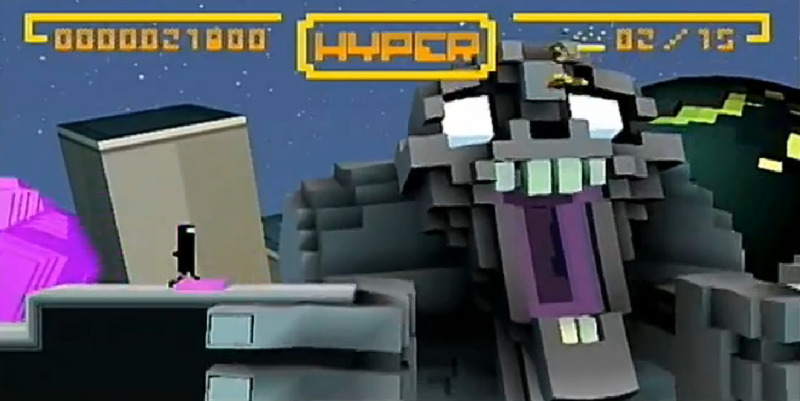 in the second level, commander video starts to run by other lifeforms. there’s a large, pixellated caterpillar who creeps out the ore to watch him as he runs past. there`s a pervasive sense of alienation here as the caterpillar moves very differently to commander video. it smoothly and quickly bobs it`s head to track the player and twitches it`s eyes and antlers very stylistically and not at all `stuttery` like the commanders animation style. I deduce it`s an intentional choice, commander video is an alien on this world. it`s only natural the planets residents would be inquisitive of him and behave differently. the caterpillar moves in the same style as everything in the environments, and even everything in the world. there`s a fair amount of story to be told from simple background animations like these. later on the game adds a `slide` mechanic. you simply press down to get under low obstacles. it feels very good to use and I attribute this to the fact that commander video is always running, so you don’t have to hold a diagonal direction to perform the move as I imagine a conventional platformer would ask you to. and just like the jump, it has it`s own musical style. sliding under an obstacle will produce a speedy three note sound. adding some energy to the audio proceedings. I think this move is a good inclusion, it seems right at home with the retro theme, as you could very easily imagine performing this move in an old 16-bit platformer. that and he makes an incredibly sharp transition from standing to sliding. (there is no in between animation) which bolsters his trademark style. another recurring issue is the text. the end level screen gives you a tally of your score, and it`s still using the overly pixellated text seen in the HUD and it just simply doesn’t read well. for world 1, the backgrounds always seems very deserted. landmarks are placed far and few between, the horizon line is almost always in view, illustrating the objects in space and natural pixel cliffs. this is because, the player is making their way towards civilisation, as the levels progress, they encounter more mining tools and equipment and deduce they`re coming closer to humanity. eventually the game introduces a `kick` mechanic performed by pressing the second button available to the player. there`s an interesting characteristic to be gleaned from this. commander video will frequently kick `no entry` signs and other various barricades. this is a representation of his unstoppable nature. he is on his journey and nothing can stop him. he is an imposing force, even violent in his means. up untill this point in the bit.trip saga commander video had simply been through journeys of self discovery but now with the inclusion of other life, he inevitably turns to violence and conquery. just like human history. as I mentioned earlier, the game uses every single tool at it`s disposal exhaustively. the visuals are no exception either, the game introduces new objects and vistas at a snail’s pace. but being how important the relevance of most objects is (like the barricade signs and caterpillars) it`s forgiveable that they don’t bombard us with thoughtless window dressing. the next mechanic to be introduced is the `spring` where you press the up direction while walking over a pink pad to be launched into the air and clear large gaps. gameplay wise, it`s as good a mechanic as the spring. thanks to the constant momentum of the game complimenting the ease of control. there`s more to it however, commander video when leaping over a spring, strikes this pose. it`s a very dominant, almost politically powerful like stance. it further enforces his aggressiveness that he leaps fist first. i`m beggining to think he should be called conqueror video. now I`ve been quite exhaustive regarding the background elements thus far. I`ve diggen deep into the game’s history by looking at every gaijin interview ever published and looking over all the previews and concept art for the title. but i simply cannot figure out the symbolism behind these things.aside from scale and to illustrate the jumps pads, I cant get a feel for it in story terms. that`s the problem with having such an open-ended, interpretable story. it`s harder to figure out when it`s not spoon fed to you. the first boss encounter in this ore valley, is some sort of miner in a spaceship who drops rocks and diamonds in an attempt to stop you. his spaceship seems to be a reverse parody of the alien encountering life on the planet for the first time. he may be a robot judging by his appearance but then again, so could commander video. it`s synonomous of the blocky aesthetic to think of them as not human. after defeating him, you traverse onto the second world. it`s a evolution of the first world. the colours are warmer and the backgrounds are more dense. there`s a lot more moving objects and lots of the scenery has eyes. all to convince you that your amidst life now. the ore collection scheme is still in operation but on a much more busy schedule. mine carts are plentiful and in constant motion, their could be an environmental message amidst all this, the last world is an urban environment after all. aside from obscuring certain details, I feel the pixel aesthetic actually lends an air of mystery to certain scenes. 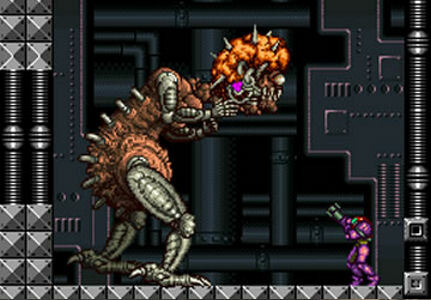 there is large masses seen in the backgrounds of the game which look like nondescript boxes, or giant pixels. but they are roughly the same size at many objects in the foreground. it makes the on-screen image at most times seem very well composed and yet, non distracting to the intense, focused gameplay. the second boss is a very square, farmer with a pickaxe and a lantern which shoots fireballs. one frustrating element, is that the lantern exudes a glow but the fireballs do not (the fireballs have been used in most levels in this world up to this point, and i feel the developers may not have wanted too many lighting effects for the level to level visuals and only special encounters like this. but in many retro theme games, lighting effects only enhance the square nature of the visuals. 3D dot heroes has a magnificent lighting system and it makes the graphics that much more appealing) the most I can garner from this is that commander video is battling untill he reaches the apex of his journey. a sterile urban cityscape. this level has some brilliancies in design. the buildings are highly evocative of visuals from the Atari era with only two large flat colours adorning the buildings, and unlike certain other elements seen before, they work really nicely with the shifting perspective. the music is much more sombre in tone possibly hinting at the city’s desertion or impending destruction. the horizon line is nowhere to be seen in this world, it`s replaced by an array of tall buildings, that and a thick fog makes the player feel very high up. there’s plenty of construction to be seen in this world, like half-finished buildings, smoke and construction equipment, enforcing my claims of commander video being an environmentalist. there is one more move added to commander videos repertoire near the end of the game. pressing right on the controls will cause an orange paddle to appear in front of him and repel very specific projectiles. this is obviously a callback to the first bi.trip beat game but it feels out-of-place here. theoretically it should work, it`s a mildly hard to use ability but it`s introduced near the end, it fits the series aesthetic and the button required for activation also makes sense. but after spending so much time with the game up to this point, the player is hard wired to instinctively dodge projectiles. so pressing right to repel them never comes naturally. the final boss of this world adds to the feeling of ascension, you are very clearly on rooftops and there is no more dense background, just sparse buildings amidst clouds. 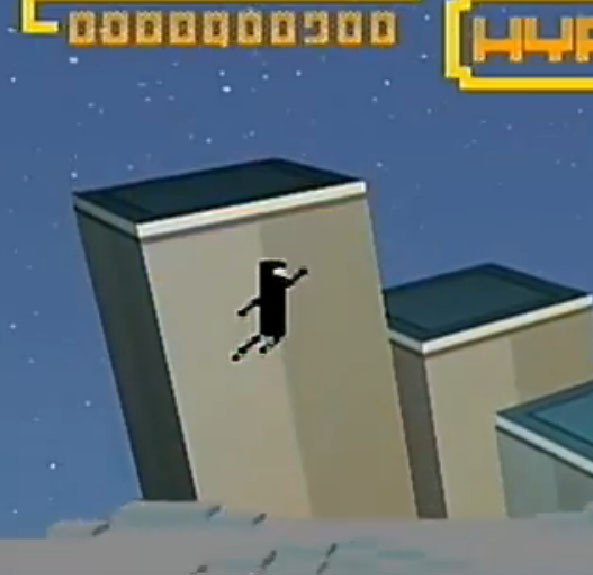 the final boss is somewhat a disappointment, he simply leaps off the highest building and lands on his head. simple, but perhaps a fitting way to finish off a platformer. wha few use of visual effects like lighting and fog, compliment the style very well.